When in the wild fish can eat whenever they want and as much as they can eat, but in the aquarium, it is your responsibility to ensure that they are fed correctly and provide them with a balanced diet. It is best to feed them very sparingly, but several times during the day, since that is not always convenient you will need to feed them twice a day with a balanced suitable food. 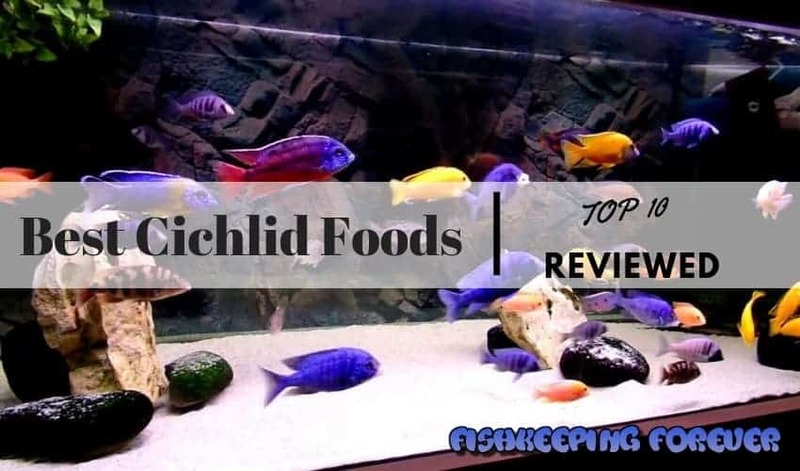 In this review of the Best cichlid foods, we’ll give you all the information you’ll need to find the right food for your cichlids. Cichlids can be broken down into three dietary groups: (1) Carnivores which eat other smaller fish, invertebrates, or plankton (2) Herbivores that eat plants, algae etc. and (3) Omnivores that feed whatever is available. In reality, this classification is not rigid as carnivorous fish need some vegetable matter in their diet, while the reverse is equally true for herbivores. 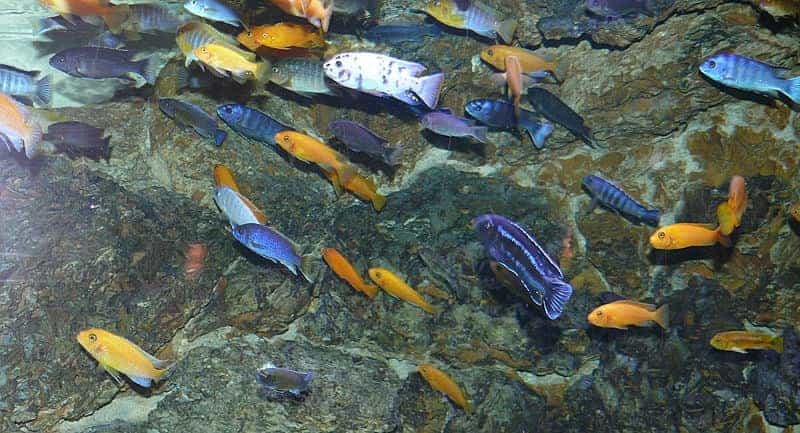 Most cichlids will happily accept a variety of prepared commercial foods such as flakes, pellets, freeze-dried, and frozen foods, and do quite well. Commercially food for cichlids is available in a variety of brands and types, in shape of pellets, flakes, crisps, granules, tablets etc. These are available in various sizes and also whether it sinks or floats in the water, so that both, the top feeders, middle and the bottom feeders can have their fill. Let’s have a look at the Top 10 cichlid fish foods available online today. (1) Flakes: These are thin slices of fish food, which normally floats on the surface of the water and is the ideal food for top-feeding fish. The disadvantage of the flakes is they break up quickly and dissolve in water losing their nutrients. They are the most popular fish food in the market. (2) Crisps: These are a slightly thicker version of flakes. They float much longer in water and the top-feeders have plenty of time to eat them. Small and medium-sized fish are best fed with crisps. (3) Pellets: These are small cubic or ball-shaped fish food that comes in the sinking, floating or slow sinking types. Various sizes of pellets are available to meet the requirements of your fish size. (4) Tablets: Tablets quickly soak up water and sink quickly to the bottom of the tank. They are food for all types of bottom-feeding fish. (5) Granules: These are food for fish that they can eat often in a single bite. Granules sink slowly so all types of fish including mid-water and bottom feeders can eat it. (6) Live/frozen foods: Bloodworms are one of the best options and make a good supplement for all types of fish. Live Bloodworms do not keep well for very long, so buy frozen ones. Frozen brine shrimps are also a good supplement and offer great nutritional value. Cyclops, clam meat and frozen daphnia are other possible options to choose from. This product is a great formula for cichlids especially small and medium-sized young ones because it is neither very small nor very big sized. 1mm is just right for different sized fish. It sinks so cichlids would find it easy to eat as it reaches the bottom without disintegrating or clouding the water. I can personally vouch that New Life Spectrum brand foods have the best protein ingredients available in the market. With the principal ingredients like krill and herring, my cichlids love it. This product has Algae Meal, with Seaweed, Kelp, microalgae, Spirulina, and some fruit & vegetable extract with a whole of vitamins and minerals. The overall formula is so full of nutrients that I actually noticed that my fish are healthier and look more colorful since I introduced this brand. 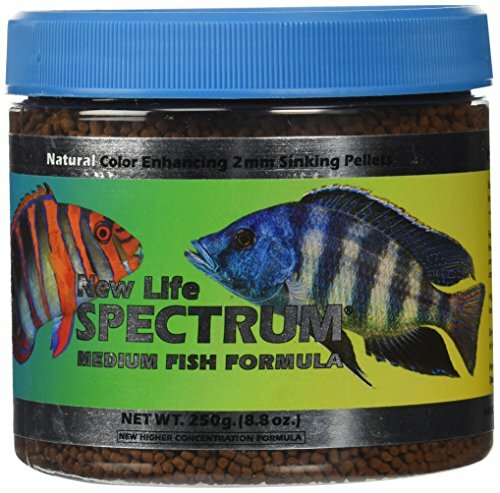 There are so many brands to choose from but New life Spectrum gives my fish just the right nutrients so that they are frisky and well fed all the time. And when it comes to meal time, I love to see them chase after the food and before you know it, it is all gone. In fact, they devour it so fast that I wonder if they are still hungry. I carefully measure the quantity when feeding them so I resist the temptation to overfeed. This is what I would recommend to you, to feed the best food available in the market and feed it just in the right quantity. Although this particular food was prepared for African cichlids, that are more herbivore that their American sisters but at least mine seem to eat it too happily. Being a gentle fish lover I do mix in some more protein-rich food like frozen brine shrimp just in case my little carnivores feel left out. If you ask me which of my cichlids really love it, it is the Central American convicts. There is nothing wrong about this food, well, it is expensive, but if you love your fish and I know you do then feed them the best. These flakes from Tetra are unique in many respects so you should check them out. First of all the Tetra Company is around this business for over 50 years. 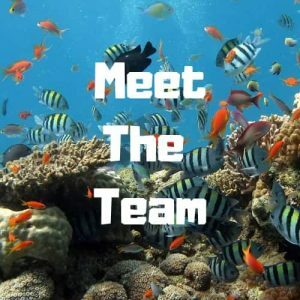 With its roots in Germany, they produce quality products, developed by their own team of biologists, chemists, and nutritionists who work continually as they study fish feeding habits and their dietary needs in their own laboratories, discover independently what keeps fish healthy, active and colorful. 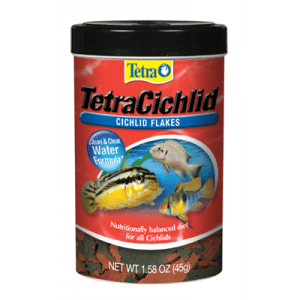 This particular food for cichlids is in the flake form and since it is Tetra’s specialty to find the best combination of nutrients in their products after extensive research, you cannot go wrong with this product. It is the best blend Vitamins, Biotin, Omega-3 Fatty Acids, and other nutrients so that the fish have super resistance to disease. It improves metabolism, immune system health, energy, and growth. Their nutritional needs are totally fulfilled and they lead a stress-free life, happily nibbling the food. These TetraCichlid flakes are designed for top and mid-water feeding cichlids and that includes both the American and their African cousins. The great thing about these flakes is that they don’t easily break apart when the fish takes a bite, but remain in smaller pieces without clouding the water. When I feed these flakes, there is food frenzy in my tank and I love to see my cichlids going crazy to finish off most of the flakes before they hit the bottom. Go ahead and buy them, you cannot go wrong. If you are looking for some economical yet nutrient-rich and balanced daily food for your cichlids then Hikari has a great product for you. I could not believe when I first heard that this Japanese company Hikari is making fish food for over 130 years. You can be sure about one thing, Hikari knows about the fish. Since the Japanese passionately care about ornamental fish and they almost have a spiritual connection with them, they do serious research to find the best food for them. They do produce a whole range of pet foods and this is one of their more economical products. Sure some fish are finicky and won’t eat one type of food or the other, but try it, if your fish love this food and most are crazy about it, then you are in an ideal situation with a great fish food, the fish love it and are healthy and it is easy on your pocket. What more do you want in a fish food? This product is floating pellet type so it will swell a bit as it floats on the surface as the fish feed on it. You can see the remaining pellets floating on the water, as they will not disintegrate and turn your tank into a murky cloudy pond. You can easily see how much the fish has eaten and what’s left out. It makes your diet planning easy and no food is left out in the tank uneaten. Buy a pack and see if it works with your cichlids. I am sure you will be hooked as will be your fish. If you are specifically looking for a food formulated to enhance the color of your cichlids, this is the product you should look into. Aqua Master Cichlid Food has an extra quantity of Astaxanthin to boost the color of your fish. This product is most suitable for pearl flower horns, red parrots, cichlids, and other ornamental fishes. Let me tell you something about Astaxanthin. It is not some dangerous chemical. It is a reddish pigment that occurs naturally in certain algae and causes the red or pink color in lobster, salmon, shrimp, trout, and other sea creatures. Being a natural product consumed by many sea creatures it is a safe additive. This product has a balanced formula that has all the nutrients needed by the fish which is easy to digest and assimilate. This product contains a composition of essential vitamins and minerals that increase the antibodies of the cichlids significantly. The fish are not only healthy they are more colorful too. Another unique feature of this food is that the pellets which are about 2.5 to 3 mm in size are coated with a probiotic which improves the digestion and improves the health of the fish. No additional artificial hormones added to this fish food. Sure some fish will not like it, but most would go crazy for it, so test it out. And lastly, it is available at a very good price. What do you do when you have a variety of fish in a single aquarium and some of them are as aggressive as you can get and some are the mild shy type and hide in the nook and crannies around the rocks near the bottom? Some of them are top feeders and some bottom feeders. Tetra had the right idea and they, in a single package formulated a fish food which is both in pellet and stick shaped. The sticks sink to the bottom albeit slowly while the pellets stay floating on the surface of the water. This food is good if you have in the tank some aggressive cichlids in the tank who like to control the feed. With this food, the shy timid ones also get to eat. Most of the food is gobbled up by all. There is a problem that some the sinking stick continue to float for a longer time. But eventually, if it is not eaten they all sink to the bottom. I checked it out with my other friends who were trying out this blended food and I had mixed opinions, some say that their fish don’t like this food at all, while others said that it was gobbled up in no time and also credit it to some color enhancement. So there you have it. It is a mixed bag of food and it has got mixed reviews. Try it and see for yourself if it works for your pets. I also found with these pellets that my catfish really enjoyed the ones that managed to reach the bottom of the tank. Anything that was left was finished off by my 10″ Plecostomus. Tetra is originally a German company that understands that every fish is unique. Each type has different food needs. Therefore they offer a variety of foods for different types of fish, from herbivore to carnivore and from top feeders to bottom feeders. They cater to small, medium or large sized fish. Some of the products they produce are unique and no other manufacturer provides it. TetraCichlid Floating Pellets is a great product for medium and large cichlids. It is formulated for all top and mid-water feeders and these pellets tend to float on the surface of the water. This has a protein-rich fish meal as a core ingredient, ideal for the carnivore cichlids. It has all the necessary vitamins and nutrients that help improve the immune system of the fish and increase their survivability. There is a color enhancer in the formula that I find very useful in making my cichlids more bright and colorful. Although the pellet size is 3-4 mm, some fish may not be able to eat the whole pellet and may take a bite off the pellet. In spite of that nibbling, the pellet will not break into small pieces or disperse to make the water cloudy. The larger sized fish will love to gobble up the whole pellet in one go. I was quite amazed that after a few days of feeding, my fish were hooked on these pellets and will not eat anything else. But still, I sometimes mix these pellets with some frozen food like bloodworms to give my beauties even more variety and a balanced meal. This really makes them grow fast. My aquarium is much cleaner and the fish are more healthy now when I am feeding them TetraCichlid Floating Pellets. Now when it comes to chocolates nothing comes close to Godiva and if you want to give a similar treat to your cichlids give them Color FX. This is the top of the line fish food you can find on the market. Of course, you have to pay the price for it. But it is all worth it, if your fish have spectacular lustrous colors and are active, healthy and immune to disease, and you get your money’s worth. To make the best fish food available anywhere Dainichi, use advanced encapsulation techniques and their ingredients are top-notch for their quality, nutritional value, color enhancing properties and last but not least, its freshness. The product reaches from the manufacturing to you, the quickest, so the food is quite fresh and retains all the potency to the fullest. Just even a passing look can tell you that you are looking at one of the most advanced formula. For nutrition, there is shrimp, Antarctic krill, algae, freeze-dried copepods, and raw Spirulina. Vitamins, clay, enzymes and pure garlic ensure that the fish are healthy and free of disease. Clay cleans the digestive tract which when combined with white fish meal, soybean meal, wheat germ, wheat flour, shrimp meal, powdered milk, and yeast makes this food combination hard to beat. All of this is in vain if the fish don’t like to eat it. Well, I can tell you without any hesitation, be it a devout herbivore or a fanatical carnivore, your fish will go crazy for it, as did mine. They love it as much as I love my box of Godiva Chocolates. Now I love a great story and here it goes. 20 years ago in Sitka, Alaska, two brothers were not happy with the fish food available for the hobbyists. So they invented and patented the process of making fish foods directly from whole, fresh Alaskan seafood and thus OmegaSea company was born. Omega One brand of fish-food is their flagship product thus providing pet owners a product of the highest quality. Unlike other fish foods on the market, you will see that there is no fishmeal in their products. Instead, they use Alaskan seafood such as halibut, salmon, and shrimp as their protein sources. These ingredients, rich in proteins and fats are purchased directly from sustainable Alaskan fisheries. They also harvest their own ocean kelp along the coast of Southeast Alaska. It all results in a quality product that will keep your aquarium healthier and cleaner. Since it is based on fish meat, it is rich in Omega 3 & Omega 6, for making their immune systems strong and the beta-carotenes from salmon to provide extra color improvement. The Omega One Super Color Cichlid Pellets Sinking comes in two sizes, small and large so you can select the size depending on the size of your fish. Some swear that it is the best fish food in the world and won’t feed anything else to their babies. They gobble this food up as soon you put it in the tank! The fish will thrive on this food; they will be healthier, active and show brilliant colors. You will never regret purchasing this item. This product is particularly good for larger cichlids like Frontosa Cichlids. 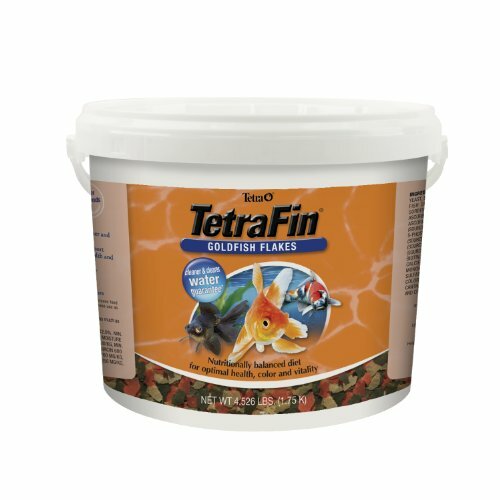 This product is again from Tetra the German Company that always strives to give you great fish food. Live food obviously cannot be encapsulated like prepared food and once the fish nibble it, it can break into many small pieces and sometimes cloud the water. These crisps do not have this issue, they will initially float but then slowly sink, to provide a hearty meal to mid-water and bottom-feeding fish. This product is an excellent alternative to live foods which can cloud the water, especially suitable for the carnivorous fish. This food consists of shrimp and dried krill that is loved by large cichlids as well as other marine fish. These crisps contain natural chemicals that help to improve pink and orange-red colors. This product is a great way to bring out the beautiful colors of large fish. It is fortified with vitamin C and other the patented, health-enhancing ingredients. Tetra Cichlid Crisps have a unique color of half green and half beige. The green half is made of concentrated algae extract and beige half is Cichlid staple diet. Despite the high concentration of proteins and fats, this product will not cloud the water and will let it remain very clean. My fish will absolutely love this food! The feeding time is one heck of a frenzied activity, whenever I feed these crisps. I am amused at the smaller fish avidness at pecking and biting them. They know it tastes good, so even the smaller fish would grab a crisp and take it to their hiding place to eat away safely. For those hobbyists who use an automatic feeder, these crisps work wonderfully. Some of the other types of food may not dispense food very consistently with automatic feeders, so if you feed the fish by a feeder try these crisps to have always consistent feedings. All Hikari products are made in Japan in their own factories, so they have good quality control over all the products they sell. The company has over eleven decades of ornamental fish-breeding experience, so they know what is the best aquatic diet for your fish. Hikari is by far the most popular brand in Japan, a nation known for it is fine ornamental fish food. All over the world, pet owners prefer to feed their fish with Hikari products, as the health of their pets, is their number one priority. Hikari has become a brand name synonymous with superior quality! Hikari Cichlid Gold Sinking Mini Pellets is a great daily food for all types of cichlids and bigger fish. This appealing daily food has all the necessary ingredients such as complex vitamins, nutrients, and proteins required to maintain superior health and high immunity against disease. 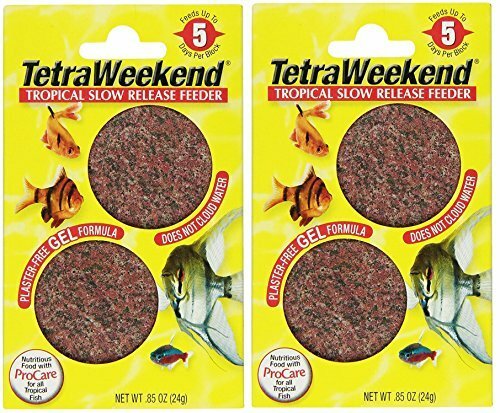 This sinking mini pellet fish food for your cichlids and tropical fish includes the highest quality of carotenoid, offering superior color enhancement while helping your fish keep their beauty all year round. It can also help to restore vivid colors to fish that have lost their color. High-quality natural proteins digest easily and result in high growth rate through efficient nutrient absorption. I recommend Hikari Cichlid Gold Sinking Pellets, as the best daily food for cichlids and other larger tropical fish who require higher protein levels. That was my round up of some of the best fish food you can find on the market. All of them are available on Amazon.com. You can get great prices for buying online and most of the time you get the freshest of the products. All the above products are of high quality, while some of them are premium products, and you get what you pay for. What I do is to feed my fish regular food which is nutritious, well balanced and economical, but if I see some color fading then I go for a product that has some natural color enhancers. Once in a while, I let them have a feast and give them the top premium product. But more often I mix different types of products and sometimes add the frozen stuff. After all, fish are animals and they, like us, like a variety in their food. However some fish are finicky in their eating habits and may not like the change, so if you really want to change the feed than do it gradually by mixing it with the product they familiar with. Well, I love my pets and try to give them the best food I can provide. It takes some efforts to keep them all well fed, healthy, active and lustrous, but if I can do it, so can you. If you’re thinking of buying a new fish tank then you might want to read our complete guide to starting a fish tank for beginners. If you have catfish you might want to read our review of The best catfish food.